An AAA Four Diamond-rated property, set in 2,200-acres, Reunion Resort is ideally located six miles from Walt Disney World and only 20 minutes from Orlando International Airport. The resort’s accommodations include luxury 1, 2 and 3 bedroom Villas plus multi-bedroom Vacation Rental Homes. The ‘jewel in the crown’ is the 11 storey Reunion Grande which features luxury 1 and 2 bedroom Estate Villas. Unusually for America, Reunion Resort is private, cashless & tipless resort. While you are there, you are a Member of the Club and your room key enables you to make any property purchases. 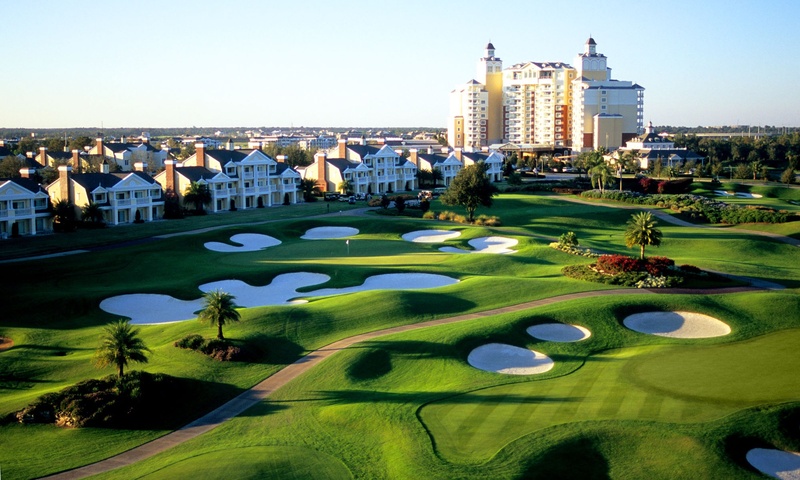 Reunion Resort is the only location in the United States with golf courses designed by the golf greats Jack Nicklaus, Arnold Palmer and Tom Watson. The resort also features the exclusive ANNIKA Academy by Annika Sörenstam, elegantly appointed meeting space, a full-service boutique spa, multiple pools, slides, water playgrounds and a 1,000-foot lazy river. The resort’s hip restaurant called Eleven features a rooftop pool and nightly views of the fireworks from nearby Walt Disney World. The Tom Watson designed Independence Course features undulating terrain with elevation variations as much as 45 feet from tee to green. 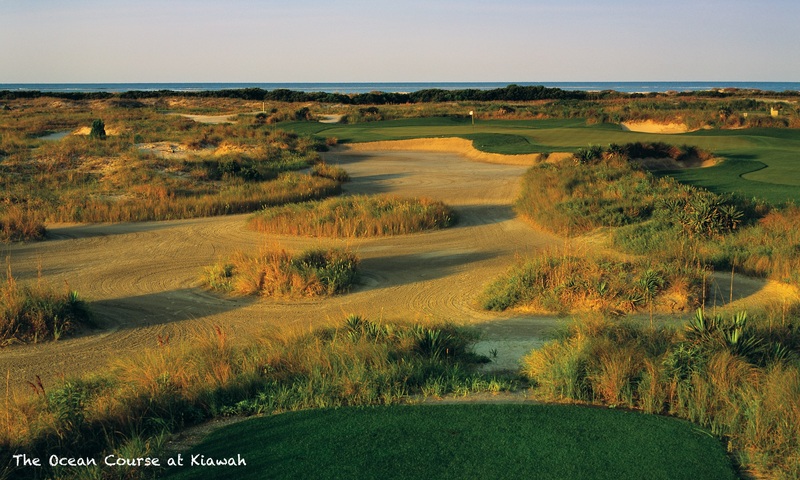 It is the first Tom Watson-designed course in Florida. A traditional, parkland style course with a windswept, native look, the Independence Course provides beauty as well as challenge. Watson deftly designed subtle openings to greens to demand a strategic, well thought out approach shots from players. Spacious, closely mown green complexes put a premium on a creative short game. Holes two through six border the Davenport Creek Preserve. Highlighted by expansive waste areas, strategically placed bunkers, spacious, closely mown green complexes and wide fairways, the Arnold Palmer designed Legacy Course is both challenging and beautiful. For Arnold Palmer fans, the short, par 4, 7th hole, which measures 303 yards for the championship tees and 274 yards from the member tees, is a vintage Arnie “go for broke,” risk/reward hole that will excite low and high-handicappers. As a layout, The Tradition contours naturally to the landscape. Not necessarily a hilly course like Tom Watson’s Independence at Reunion, The Tradition was designed to flow smoothly and gently from tee to green. A target, parkland-style course, The Tradition was designed to be a players’ course rather than what is often referred to as “resort golf”. The 7,300-yard layout is not exceptionally long by today’s standards, but postage-stamp greens, forced carries that lead to fairway targets sometimes only 50 yard long and fair amount of trouble for wayward shots give The Tradition plenty of bite. Enjoy upscale resort living, each villa is open and inviting for families and couples alike. Each providing a large dining area and spacious living room for everyone to gather. Select from one to three bedroom villas, many featuring multiple bathrooms, everyone will love having their own space while on vacation. Daily housekeeping service included. Reunion Grande offers a choice of 1,292 sq. ft 1 bedroom and 1,950 sq. ft 2 bedroom Estate Villas. Centrally located next to the golf clubhouse it is ideally located for access to guest services, restaurants and shops. It also has a rooftop pool. There are also 1, 2 and 3 bedroom Deluxe Villas which offer fully fitted kitchens, full-size TV and DVD/CD in the living room and master bedroom. There is also a dining area, living room, private balcony with chairs and washer / dryer. Most units have a queen sleeper sofa in the lounge. All accommodations feature a Master Suite with King size bed and private master bathroom, Second Bedroom has Two Double beds and bathroom, Flat-screen TV and DVD/CD in living room and bedrooms, Spacious Dining and Living Room Area, most with Queen Sleeper Sofa, Complimentary high speed wireless internet, Spacious Private Balcony with table and chairs, Washer/dryer in villa, Upgraded Décor and Technology Package, Complimentary valet parking, Nightly turn-down service. Forté Grille serves traditional American cuisine in a warm and rustic atmosphere. Perfect for any intimate dinner meetings. Seasonal hours. Eleven boasts a spectacular location atop the Reunion Grand on the 11th floor. This indoor/outdoor rooftop restaurant offers seasonal dishes and cocktails. The Clubhouse offers a wide variety of traditional American breakfast, lunch and dinner dishes. Dine indoors or out – either way you’ll enjoy spectacular views. Longboards and The Cove at Seven Eagles serves up a variety of poolside favourites to enjoy with a full service bar. The Grande Lobby Sushi Bar offers a global wine list and variety of sumptuous appetizers, featuring freshly prepared sushi by Chef Michael Ha for your dining pleasure. Chef Ha has created quite a following; visit the Grande Lobby Sushi Bar to see firsthand! In-Room Dining delivers a variety of dining options, from full meals to snacks, right to your door. A boutique spa offering serenity and luxury with massage therapy, skin and body treatments and nail services, all with the intimacy and warmth of home. Whether in one of the carefully appointed treatment rooms, outdoors on the second story veranda or in the privacy of your suite, it’s the ultimate escape. And with the personal attention of our Spa Concierge, no request goes unheeded. Get your workout in with state-of-the-art cardio and weight-training equipment. You can even check your email on the treadmill or watch your favorite talk show on a screen built into the elliptical trainer. We also offer weekly yoga and aqua fitness classes. Reunion Resort has a 5-acre water park, 10 shimmering pools, tennis, outdoor activities and more. The water park includes water slides and a lazy river. Orlando is full of excitement and adventure, and Reunion Resort and Club is right in the middle of it all! Perfectly secluded, the Resort is your getaway while still being just minutes from the attractions and entertainment that make Central Florida a top destination yearround. Local attractions include: Walt Disney World®, Universal Orlando®, SeaWorld, Legoland® Florida, Orlando Balloon Rides and Baseball Spring Training.